Most of this was my own fault. I had been looking at the weather reports for the Sierra and they were pretty consistently calling for 30-40% chance of thunderstorms over much of the area. This would be a little iffy if I was dayhiking, but with proper attire it could be managed. As a backpacking trip it was a roll of the dice with poor odds. I'm pretty much a fair weather fan and usually give such forecasts due credence, but I was a bit stubborn this time. I have about 8 remaining CA 13ers and five of them are deep in SEKI and most easily accomplished as a backpacking trip. Two of these are located on either side of Thunder Mountain, unnamed Peak 13,228ft and unofficially named Sky Pilot Peak. My plan seemed pretty simple - Pack in 13mi to East Lake, camp. Climb the two peaks the next day. Pack out on the third day. I carried no stove or fuel and planned to eat trail snacks. I brought a rain jacket and umbrella, expecting some rain. I had two changes of clothes with the exception of my one pair of pants. This seemed adequate preparation. As I drove through Fresno around 11a and into the Sierra, the sky was heavily overcast. Rain fell on and off as I drove the remaining two hours to Roads End at the terminus of SR180. I was surprised when the ranger told me there was one spot left for East Lake as he checked off the last box on his whiteboard, some 15-20 boxes all told. I paid my $15 for the Wilderness permit and was off on my way by 1p. For the most part, it was an enjoyable hike, the first two miles relatively flat along the Kings River, then the relentless climb up Bubbs Creek to Junction Meadow, taking some four hours. It rained some along the way, but the umbrella worked nicely and by the time I had reached the meadow the skies were completely clear - things were looking good. The Bubbs Creek crossing wasn't too bad. I rolled up my pant legs and took off my boots. Turns out the water was over the knees and my pants got wet anyway, but little matter - they would dry soon enough. More climbing up the trail to East Lake followed, where I arrived around 6:30p. I found the campsites at both ends of the lake completely deserted. I don't know where all those folks were that the ranger had checked off in the little boxes, but they weren't at East Lake. (Later I found that the permit was for Bubbs Creek, one of three trailheads out of Roads End that they have quotas for. By far the most popular route is the clockwise direction for the Rae Lakes Loop, so the Paradise Valley permits fill first. Second choice is the counter-clockwise direction, thus the popularity of the Bubbs Creek TH.) I set up camp at the south end of the lake next to the bear box and got out some food in the way of dinner. The mosquitoes came out in droves, forcing me to walk around while I ate, and despite DEET, a headnet and a fleece, I still managed to get bit. I really, really, really hate mosquitoes. They eventually drove me to bed earlier than I'd have liked. I had hoped for a rinse in the lake but that wasn't going to happen without losing more blood so I simply rinsed my face and called it a day. It was all I could do to get myself into the bivy sack, undressed and changed to fresh clothes without my body cramping or the mosquitoes finding a way through my defenses. "Just in case", I had left my daypack in the waterproof bearbox with my food and left my boots under my backpack with the raincover on. So far, so good. I'd forgotten to leave my headlamp with me in the bivy sack and hoped I didn't need to pee in the middle of the night. There was a full moon on tap, so that would make things easier. I eventually drifted off to sleep. After a few hours the first pitter patter of raindrops could be heard on the outside of the bivy. I was smug in my preparations, happy that my boots would be dry the next morning. I wasn't thrilled with the prospect of having to pee - I'd get wet and it would be pitch dark and I'd probably make a mess of things. Then the thunder and lightning started. Big bright flashes of light (no need for a headlamp with this show going on) followed by pounding thunder. The rain only came down harder. Though the bivy sack is waterproof, if I had zipped it closed I would have gotten much too warm and possibly suffocated in the stale air in such a small space. So I had to leave the front unzipped at the bottom to let air in, but unfortunately the rain was coming so hard that it splashed droplets in through the narrow opening. Sometime in the night I noticed that my pillow was getting damp. My pillow consisted of my spare clothes inside a stuff sack, covered with the shirt I had worn that day to make it softer. My socks from the day were layed out near the opening to let them air dry. Or in this case, get soaking wet. On and off the rain pounded me all night, but I was still warm and fairly dry inside my sleeping bag. All was not yet lost. Thank God I didn't have to get up to pee. I finally got out of bed around 7a after the rain had stopped for about an hour. The mosquitoes were there to greet me as I dressed in my damp pants extracted from my pillow. At least the pair of socks I wore were dry. I strung up a clothesline and then proceeded to hang up my stuff. I left the sleeping bag and padding inside the bivy and hung it all over the line. The stuff wouldn't dry as well as if I'd separated them, but I had no guarantee the rain was done. I hung up my wet pair of socks and the ground cover, ate some PopTarts and headed off. Hiking would help warm me up. 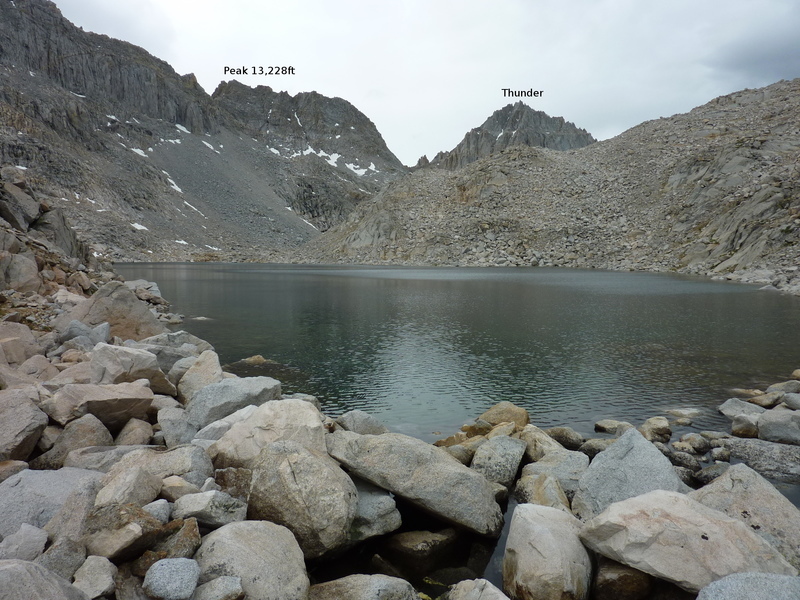 I reached Lake Reflection in about an hour, hiking the weak trail that leads from East Lake. The vegetation was all wet, of course, and over the course of the hour much of that dampness was transferred to my pantlegs, boots, and eventually to my socks. With the skies completely overcast, the mosquitoes had no quitting time this morning and stalked me the entire way. I met a large group of hispanics camped at Lake Reflection, not looking much happier. "The mosquitoes!" they lamented. I continued around the west side of Lake Reflection, thrilled to eventually be out of the vegetated areas and onto the rockier stuff. At least my boots and feet wouldn't continue to get wetter. I scrambled up steep slopes to reach the unnamed lakes just west of Mt. Jordan. I'd been up here twice before and knew that once at the lake there would be much tedious boulder-hopping. By now I was three hours into the outing and was getting tired. I had to admit the 5,000ft of gain the previous day with a backpack had been draining. I was also starting to feel nauseous. Crap. I could see Longley Pass and the obvious (and somewhat easier) route to Sky Pilot Peak. I had planned to do that one second after Peak 13,228ft but was now wondering if I'd made a mistake. I kept going until I reached the outlet of the largest of the unnamed lakes. Here was my first view of the peak, with Thunder Mtn to the right across Thunder Col (just out of view). More crap. Secor had described the Southwest and East Faces as class 2, but those were both on the other side of the Kings-Kern divide, requiring a more roundabout effort. I was hoping to find a reasonable route up from the north side of the crest but it looked much harder than class 3. I really didn't want to go over Thunder Col, a mile and a half over rough terrain. I took off my pack, sat on a flat rock and ate some food in hopes of settling my stomach and giving me a boost. It didn't seem to do either. I was hoping that the sky would clear in the afternoon much as it did the day prior, but all was gray without any sun or blue sky to be seen. If it started raining, the boulder-hopping would become more dangerous. I thought of my wet things back at camp. I looked at my wet boots. None of this was good. I decided, ultimately, that I wasn't having fun. And that was really one of the main points. Sweating and working hard, those could still be construed as fun with twisted logic, but I really hadn't enjoyed anything since I arrived at East Lake the previous evening. It didn't take me long to consider that if I returned now I might still have the energy to hike back out to Roads End. I had dry clothes there and a more comfortable sleeping bag and padding. Screw it, the 13ers could wait for better weather. It was 12:30p by the time I returned to East Lake, having spent more than five hours on the losing effort. This would weaken me for the return to Roads End, but at least it was mostly downhill. I packed up everything, adding a few pounds to my load due to wetness, and headed off. At the Bubbs Creek crossing I once again took my boots and socks off, carried them in one hand, a stick for balance in the other. I didn't bother rolling up the pant legs. Turns out the overnight rains had raised the water level by 3-4 inches and it was now up to my crotch. This was somewhat dangerous as the force of the water pushing on me was near my ability to fight it and maintain balance. Halfway across, at the deepest part, I decided my boots were a distraction and tossed them to the opposite bank. They landed ashore ok, but one of the socks bounced out and landed at the edge of the water. A damp sock was now a wet sock. Both socks would be equally wet before I was through, thanks to the wet foliage overgrowing so many parts of the trail. I still had more than ten miles to go when my feet started to complain. The combination of heat, wetness and friction were working their magic. Had I REALLY been prepared, a pair of dry socks right now would have worked wonders. Moleskin could have helped, too. Even some duct tape over the toes could have saved them from getting worse. I had none of these things. I did have some lip balm and thought that might help reduce the friction. So I stopped at the junction with the Sphinx Creek Trail and applied some of that. Didn't seem to help much. No matter - I could trash my toes as long as I made it back to Roads End. That was the end-all of everything at the moment. Having to stop and camp along the way because my toes were sore was simply not an option. Who are you and what have you done with the real Bob Burd our peak bagging hero. Obviously, those can't be Bob's feet! I actually went out to do some backpacking myself on 7-1-15. Bob is my hero and I always carry his trip reports, and secretly try to beat his times. Some times I do, some times I don't. Wednesday I climbed the Shepherd's Pass with all my stuff (tent, bear box, stove, fuel, food). It was raining almost from the start. At the pass, I felt lonely as I saw nothing but dark clouds. I made it down to the ranger station and into the Kern River Valley. The sun came out, things were looking good. I made camp, washed myself and socks and put them out to dry. Tremendously loud thunder woke me up in the middle of the night, it was dumping. In a daze I pulled my pack and boots into my tent. I left my socks out at night and it was raining so hard I didn't bring them into the tent. Still, I was dry as can be, I slept like a baby. I have a black diamond, I've lamented carrying it all around for years, but all those years of work became worthwhile. On 7-2 there were clouds and sporadic clouds as I bagged Kern Peak and then Picket's Guard. I made it back to my tent by 5, at dinner of quinoa and cous cous with olive oil. Very tasty. I slept well that night. Friday I packed out under sunny skies, got back to the trail head by 5. My socks and boots were soaked the whole time, but what could I do? I already took the vacation time from work and the time away from my family. Back in Lone Pine by 6, I ate a bunch of sandwiches I grabbed from a gas station because I was too hungry to wait for the people at subway to make me one or two footlongs. I may or may not have consumed a bottle of wine after a shave, a hot bath, and sandles. Fun fun. In a few weeks I want to bag Finger and Tunemah and possibly Tehipite and Spanish on the way out in a three - four day bender. We'll see. I was all cozy and warm in my cabin during these latest storms that passed through. The thunder and lightning show was so dramatic, it woke me up multiple times during the night, so I got up and watched through the windows. Let me guess....the first two comments are from mrchad and 1000pks? I had lots of wounds to lick after my weekend of bagging Moses Mtn, Angora Mtn and Coyote Pk. It felt like I spent 40 days getting up to Moses Mtn..lol. No, the second one is by Charles Martinovsky. I didn't put my name, for fear that someone would read it the wrong way. Bob is an inspiration. I just love to get outside...sometimes it rains, sometimes it snows, mostly it's sunny; but it's always better than doing almost anything else... especially spending time inside a building. There is a great little glass jar of a register on top of Auden Dome (aka Fin Dome aka Nanatuk) 1 mile due North of 13228 - goes back to 1936 filled with the sigs of many of the Usual Suspects - nice side diversion when you're up that way next! Hey Sharperblue - Thanks for the (above) comment ! If I don't get back to Peak 12,240+ maybe Bob will be nice enough to take a photo of my June 1976 entry ? I had always called that peaklet Reflection Dome.